Databox is a business analytics KPI dashboard. It gathers all your metrics in one place and helps you deliver the crucial KPIs across multiple devices. In this article, we’ll walk you through 6 steps you need to get started with Databox. By the end, you’ll be able to use data to acquire, retain, and grow your services. If you don’t already have a Databox account, navigate to databox.com to sign up for a 15-day free trial! 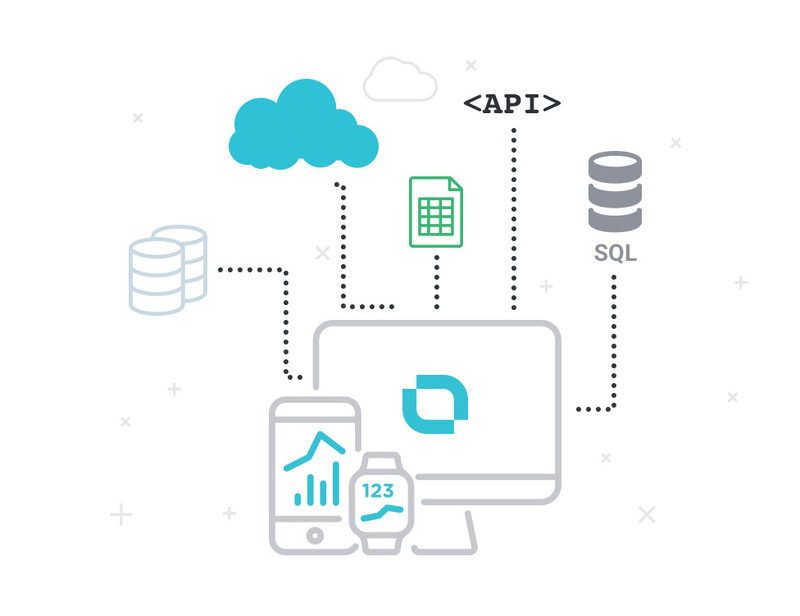 Databox’s flexible data architecture enables you to connect to a wide range of data sources, including analytics solutions like Google Analytics, HubSpot, Zendesk and Salesforce to Google spreadsheets (Zapier), custom data or even Structured Query Language (SQL). The easiest way to get started is the use cloud-based data sources such as Google Analytics, HubSpot, or Salesforce. Once you hook up your desired data sources, you will be able to pull and visualize the metrics you care about the most. 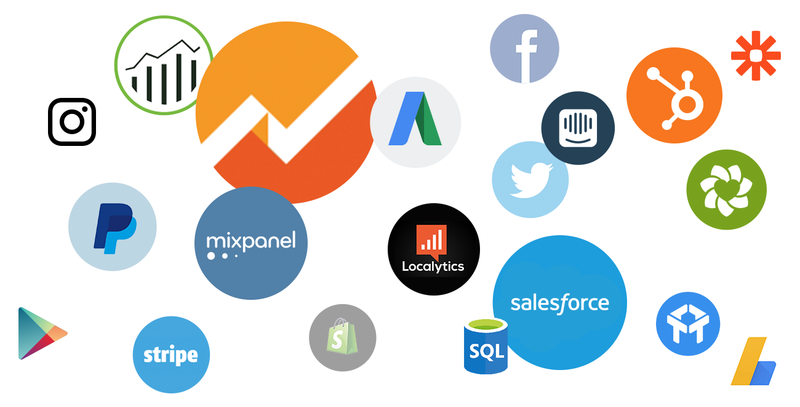 Databox offers several one-click integrations with Google Analytics, Hubspot, Adobe Analytics, Mixpanel, Localytics, Zendesk, Stripe, QuickBooks, Facebook Ads, Google AdWords, Google AdSense, Intercom and many more - see the whole list here. Within the Databox platform importing data from Google sheets is not directly supported. However, you can do it that via our Zapier integration tool. More about Zapier integration can be read here, as well as a detailed use-case for importing Google sheets data into Databox. When data needs to be structured and stored in an organized manner, SQL is likely the tool to use. At the moment, MySQL, PostgreSQL, Microsoft Azure SQL, and Amazon Redshift are supported out of the box in Databox. With Databox for Developers you can push any custom data to Databox API with the use of our SDKs. Currently, the libraries are available for Java, PHP, Node.js, Ruby, Python and Go. Once you log into your Databox account, go to the “Data Manager” section and click “+ New Connection.” Select which data source you would like to connect, and enter your login credentials. Once you approve Databox access to your account, you will be able to pull the desired metrics from your data source(s). After your data sources are connected, you can create your own unique dashboards and visualize your metrics the way you want. We offer more than a dozen visualization options, with others on the way. Databox dashboards are highly customizable to allow custom titles, colors, branding and many other variations. Databox designer, our drag-and-drop editor allows you to fully customize how you see your data. This is also where administrators go to to manage users, configure alerts, etc. We’ve put together a handy video to help teach you everything you need to get started with the Databox Designer. The Databox mobile app is the uppermost layer of the Databox platform and the most user-oriented tool in the suite. It provides instant business insights through an intuitive experience tailored for smartphones, tablets and wearables. Supported are both major platforms, iOS and Android. To download your version of the Databox mobile app, navigate to either the iOS or Android page or just open your iTunes or Google Play store and search for "Databox". Once installed, login with your Databox account. 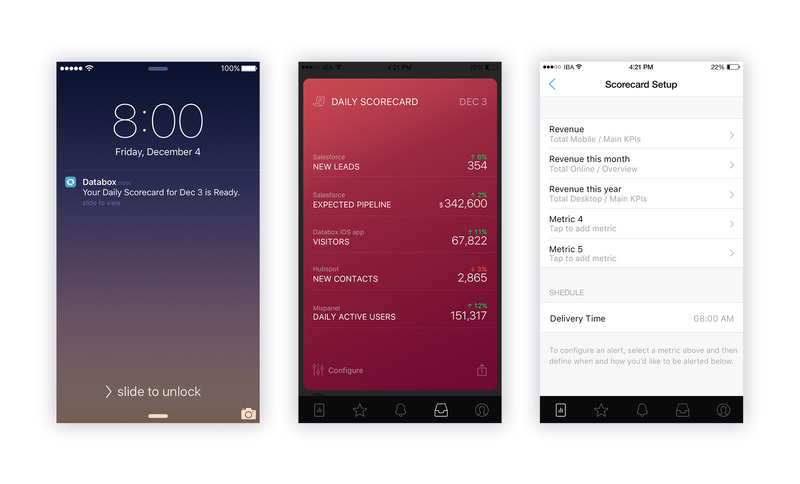 The Daily Scorecard is one of the most essential features in Databox. It will help you understand how your business changes on a day-to-day basis, and as a result you can shape your upcoming day to make the biggest impact on your company. A scorecard is a short daily report comprised of up to 5 of your most important metrics from yesterday, delivered to you either by push notification or email each morning. We encourage you to customize it and add metrics that will be of the most value to you and help you kickstart your morning. Here is a detailed article on how to setup your first Daily scrorecard. The ability to share metrics, charts and views on Databox helps you solve critical problems faster by instantly including your team in the discussion. There are many ways you can share your dashboard in Databox and to start meaningful conversations around metrics. You can set Users and Roles to define permission levels and define what content can be viewed, or you can share your dashboards with larger audiences using a published link. Here is a detailed article how to add your first team member to Databox. Once you’ve got these steps under control, there’s plenty more to explore. Set up goals and track your progress over time, connect Databox to Slack to bring business insights directly to conversations and more. Continue your journey with Databox by checking out our HelpDocs site or by reaching out to our helpful customer success team to hone your Databox experience.